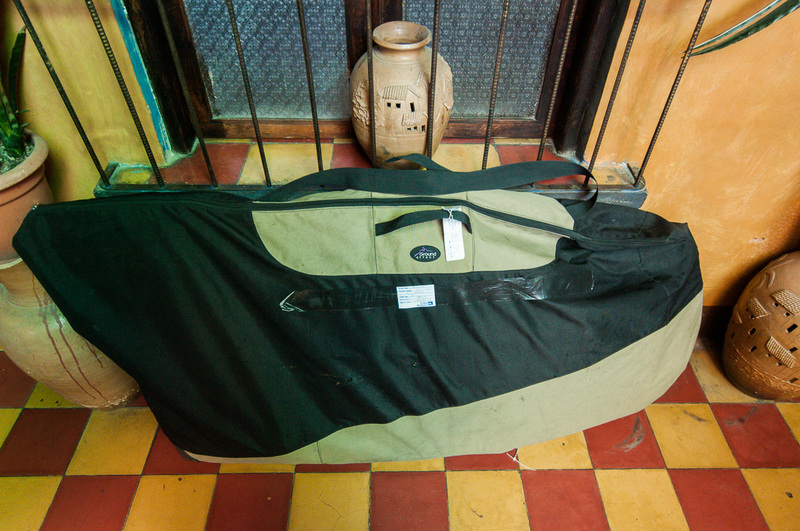 The Body Bag in Guatemala, after a trip to Cuba in 2010. On this occasion, I rode out to Havana at sunrise. Sourced some protective cardboard from a janitor. Then popped it in the back of a minibus to avoid the traffic chaos of Guatemala City. But when the deed has to be done, several methods exist to help best negotiate the ordeal, be it using cardboard bike boxes found in the local bike store, specialist vault-like hard cases, or even the humble polythene bag. My personal favourite – when it comes to burly mountain bikes or touring bikes at least – is something of a hybrid: Ground Effect’s Body Bag. As the name suggests, the Body Bag is a capacious sack that can engulf your steed with the minimum of fuss – and then pack down so discreetly you can cycle out of the airport with it stowed in your backpack. Compared to a traditional cardboard bike box, the Body Bag is so much easier to manhandle – it can be carried over the shoulder (teamed with a duffel bag of gear on the other side), fitting neatly into all the X Ray machines I’ve ever encountered (and the back seat of a taxi too, if you’re leaving or arriving under cover of darkness). And being more manageable also seems to incite less glares from the steely eyed check-in desk. Once at my destination, I generally stash the folded up bag at a guesthouse or warmshowers host. If it’s an A-B ride, I’ll even post it onwards, seeing as it weighs just a little more than a kilo (thus saving the inevitable last minute search for a bike box). Worth noting too it that the Bodybag is especially convenient if you’re transporting your steed on a train or bus that won’t accept a naked bike. I’ve used mine on Eurostar, Greyhound and Amtrak in the past, for both road and touring bikes. For overland transport, It’s a particularly quick and easy solution when companies are being awkward. I’ve always liked Ground Effect products (the Robin Hood is a firm favourite) and found them to be well made and nicely thought out. The Bodybag is no exception. Build quality on the Bodybag is good – hard wearing Cordura with reinforcement patches in all the right spots. Mine has joined me on many of my journeys – I’ve ridden with it out to the airport in Havana, jammed it into a rickshaw in Delhi and stowed it in the back seat of a cab in Bogota. Only after years and years of successfully protecting my steed from bungling baggage handlers the world over, has the zipper finally blown. Apart from that, a few wounds incurred in the line of duty have needed to be patched up here and there – I try and wedge in big pieces of cardboard so there’s no excess material to be snagged, and make sure nothing can pierce the bag internally. Rather than repair it this time round, I’ll be using this excuse to replace it with exactly the same – albeit the latest, even more capacious version, designed with 29ers in mind. Not that my old version isn’t roomy; perhaps to the detriment of my zipper, in the past I’ve squeezed in my XL Surly Krampus, with the fork removed. A Troll fits in easily, even with a rear rack. More details can be found here, and another online review here. The new version is 172cm long by 80cm wide (15cm or so longer at the zipped end than the previous one). Cost is a very reasonable £69 plus £15 shipping from NZ to the UK, or $109 including shipping to the US. Weight is just 1200g. At LAX airport, having ridden in along the seafront from Santa Monica. Cardboard sourced and ready to pack. If you’re checking out the Body Bag, it’s worth knowing that Ground Effect also makes the Tardis. Like its Gallifrean namesake, it’s small on the outside and big on the inside. A good deal more compact than the Body Bag (135cm by 80cm), the Tardis requires more bike dismembering for the jigsaw puzzle to work. Weight is a little higher at 1800g, but less padding is required. Concur, it’s a great bag 🙂 mine has a few patches now but nowhere near as well used as yours 🙂 cheers for the heads up they’ve made a bigger version. Not sure how much bigger the new one is over the old one (haven’t got round the measuring mine) but even a few cms would be welcome for big wheels. 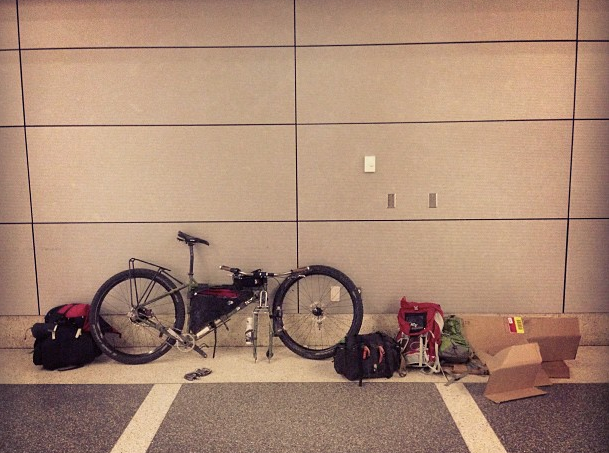 Squeezed in my Krampus when I took it to Ecuador, simply by removing the fork and putting it in my duffel bag. that’s useful to know. I gave up trying to squeeze my ECR into my current one for the trip to Crete but I was too lazy to take the fork off… mainly because I had a bigger bag kicking around from when I used to travel more for training, racing and stuff, the weight and bulk of which didn’t really matter for Crete. I’ll use my body bag again later this summer. Apparently the new Body Bags are around 15cm longer around the zipped edge, and the Tardis’s around 8cm longer, with adjustable wheel sleeves to cater for larger rims and tyres. Do you usually get dinged for the extra charge for a steed or does this pass as luggage ? Although it has on a few occasions, it doesn’t usually slip under the excess baggage radar, unfortunately. As an aside Mark, I’m generally pretty careful about scouring for airlines allow bikes to be included in your allowance. There’s a fair few, you just need to search them out. If you pack light enough, you can generally get away without any excess charges by stowing extra gear in your bike bag/box, and loading up the backpack or pannier you take on the plane with the really heavy stuff – I’ve never had mine weighed. No one likes that frantic last minute search for a cardboard box at the end of a trip. My old bike bag is on its way out, grumbling zippers etc. I’ll put this on my list for my next Ground Effect order. As it happens, I might just replace my Body Bag with a Time And Relative Dimension In Space bag this time. Just checked, and both models have been updated to be more fat bike friendly. I have a trip planned to France – turns out that the TGV line to the South of France are double deckers, so don’t have a capacity for booked bikes, like many of the other TGV trains do. They’ll only take bikes in a tiny 120cm and 90cm bag. The Tardis is 135cm by 80cm, so should hopefully slip under the radar. I’d concur with regard to the Tardis bags – we’ve one each and they’ve been used multiple times with a variety of bikes. They have the advantage (over the body bags) of packing horizontal in the boot of a normal taxi/car. Yes, they do take a little more packing, but the boot-ability is very handy. Ours (the old version) take fat bikes fine – I don’t use the wheel-sleeves, but use a single cargo strap to strap the wheels with tyres on (deflated) on either side of the the frame. Thanks for the feedback Tom. I’ve had both a Tardis and a Body Bag in my time, and really like both of them – the Tardis happens to fit perfectly into the boot of a Tata jeep, which is why we always used to recommend them when we ran our trips in Northern India. Good to know the old Tardis fits a fatbike fine (a fatbike just about works in the BB, but it’s a squeeze) – I wonder if that’s the case with an XL frame too? I guess the reasons I’ve always found myself reaching for the Body Bag is that its dimensions are still a good deal smaller than a bike box, it rolls down that bit smaller than the Tardis, it’s lighter, and it’s quicker to pack. And I like the fact that the rear wheel remains in the stays. It’s a great choice for train and bus travel too, which I always seem to end up travelling on in the US. But as my old Tardis is lost in storage, I going to give the new version a whirl. Will see how it fares! I’ve used the BOGear Royd Bike bag, http://www.bogear.com.au/royd-bike-bag, for interstate transport here in Australia. Very similar to the Tardis. Packed a track bike and two sets of wheels into it for one trip. Happy as Larry with it. Thanks GT. I’ve always hankered after a BOGear backpack. Looking at the site, I don’t see mention of the exterior dimensions – just that it fits ‘some 29ers’. So perhaps a little smaller internally than the newer version of the Ground Effect Tardis. Glad the Body Bag has worked for you Cass. Have to say that i was disappointed with it ( old version ) for the price. Mine had holes in it after using for the very first time on one flight! Yes, i packed carefully. Well, nothing is indestructible and baggage handler proof, but i DO think Ground Effect need to use a stronger material.I expected it to be tougher, otherwise may as well use a cheap bag. I’ve since patched it up and it’s usable, but for me at least, i found this particular product to be so-so. Appreciate your comment and thoughts. Sounds like your bag really got mauled. Mine has had to be patched here and there over the years (easily and cheaply done in many overseas countries). But nothing as bad as what you’re describing. In fact, you can see a couple in the picture above – but from what I remember, that’s after several journeys. Thanks for the heads-up about the body bag. I went Calgary-Heathrow, Heathrow-Delhi, Srinagar-Delhi, Delhi-Calgary last summer using a plastic bag and it held up pretty well. But I got very mixed responses at each check-in (from outright refusal – initially, at Heathrow – to no problem at all – Srinagar, where they charged me a little excess that I’m pretty sure was off the record. I wasn’t looking forward to the same issues, this time with two bikes (getting to travel with my wife this summer :), so your article was timely. We settled on two Tardi, and they arrived promptly and look very well made. Regarding one of the comments above asking about charges to fly with a bike: Air Canada wanted $450 for the three legs Canada-England-India-Canada. British Airways had the same basic fare but no charge for the bike. Recently acquired Ground Effect Body Bag ( not Tardis ) to transport my Surley ECR on a combined 5 hour flight to Western Australia . Tyres deflated , saddle + pedals off and front wheel off as per airlines requirement. Only $40 AUD for bike transport. Had trouble getting the bike to fit , but managed with some squeeze.Managed cardboard inserts on both flanks of the bike. On arrival the zipper had split and also had a tear in material next to the split. A kind seamstress replaced the zipper with heavy-duty sailing/yachting zipper and also sewed in a heavy duty canvas insert of 10 cm wide along the rounded (back) end of the Body Bag. The return trip had no damage to bag. I think the canvas insert allowed less stretch over the bike and the zipper was bulletproof.Also allowed for cardboard gutter for bike + exposed front fork ends to sit in , cardboard flanking panels and cardboard gutter over exposed seat and fork posts. Sounds like 29+ might be on the edge of its remit – this said, I managed to get my XL Krampus frame in there. The older (smaller) design too. It was a squeeze, but the zipper didn’t blow, thankfully. Hi, nice tip for flying with the bike. I wonder what brand and model is the small rearrack in the last photo? It looks very clean and minimalistic. It’s a Tubus Vega. A nice minimal rack, that’s pretty light too.